It was my intention to travel through China Mainland, but the overall unrest and the disaster at Tiananmen Square made me cancel my plans. I shared the world's disgust of how the Chinese leaders acted on the student protests. In the end I opted for a ticket to Hong Kong and locally decided on a package tour into southern parts of China (both politically as well as geographically a considerable distance from Bejing). 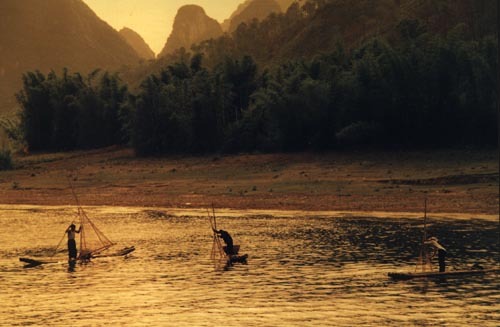 The trip was worth taking and resulted in another visit to China, a few years later. But first an impression on this visit in 1989. 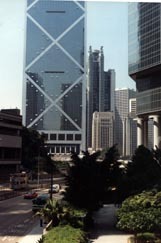 Two very distinct "faces" of Hong Kong: the high-rise buildings of conglomerates have to illustrate the success story of Hong Kong. And the very Chinese face of the streets, where people sell all sorts of stuff and the Chinese characters cast no doubt of who live and work here. 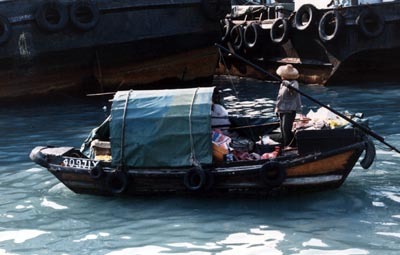 It is great fun to explore the harbors of Hong Kong. People live on these boats and sell among the community here. I found the scene behind the Yau Ma Tei typhoon barrier very.... uhmmm, Oriental ? 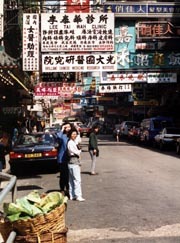 At the time of our visit Hong Kong was still a British Colony (since 1841). 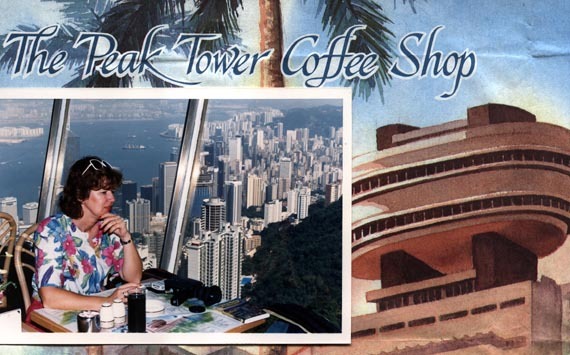 A recommended visit to "The Peak" on Hong Kong Island; it provides a very nice view over the Financial District, Kowloon across Victoria Harbour and in the far distance the airport of Kai Tak. For this trip and others we used the Lonely Planet travel guide, though for many US holidays I preferred the "Handbooks" by Moon Publications. Time to get on a train to Guangzhou, at one time much better known as Canton. At the time of our visit this city numbered a population of over 3 million ! It's an economic force in China, but overshadowed by Hong Kong's reputation. We visited the Chen Family Temple. In most places the Red Guard of Mao destroyed everything nice or ornamental, as these were considered bourgois during the Cultural Revolution. 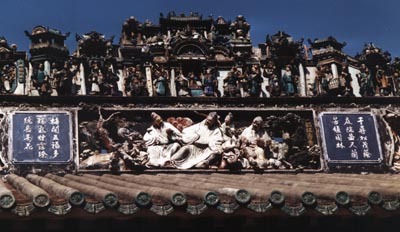 But the southern parts of China were less influenced by this collective madness, so the detailed carvings and terracotta sculptures of this 19th century temple (in late imperial southern Chinese architecture), remain unharmed. 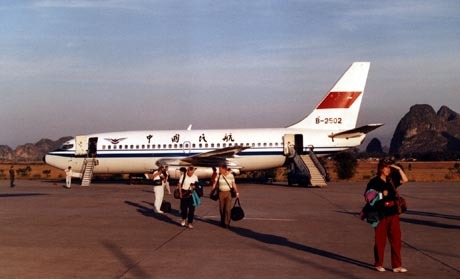 We arrived in the late afternoon at Guilin by domestic CAAC ("China Airlines Always Cancels") flight. Things went rather well. I had braced myself upon reading Paul Theroux's words: "transportation in China is always crowded, it's nearly always uncomfortable and it's often a struggle. The pleasures are rare, but they are often intense and memorable." That was describing it rather accurately, I think. A good book too, "Riding the Iron Rooster". We found air travel to be just as 'adventurous'. 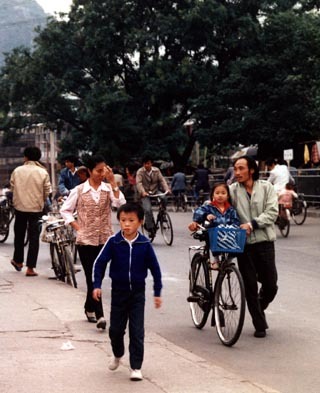 In 1989 cars were rare in the streets Guilin, which is not exactly a small city. Drivers have enormous status because of this, much more than a tourist guide. Our guide, on a tour of the city, was afraid of him: he could make or brake her. As a result we had to go where the driver wanted to go, not where we wanted to go. And everywhere you see bicycles. People smile when you take a photo of them and proudly point out the photographer to their children. They can have only one and dote upon these "little emperors". 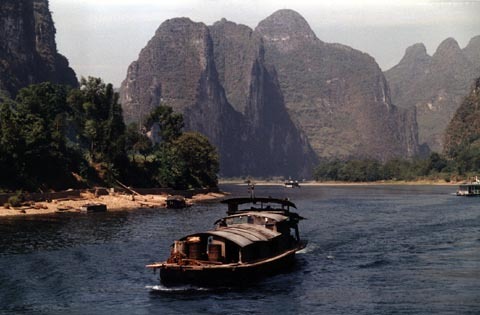 The province of Guangxi is very beautiful and the river trip on the Li-Jang river (or short: 'Li River') between Guilin and Yangshou really sets out those limestone peaks. I thought it one of the most beautiful places I've ever been to! 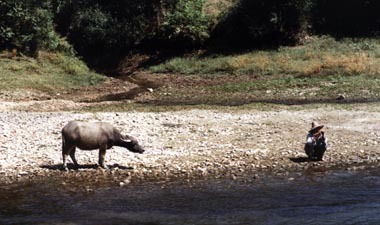 The river provided lots of nice photos and there never was a dull moment. 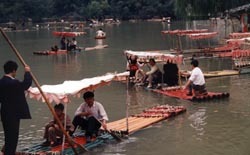 What do the Chinese, in Guilin, do on Sundays or on their days off? 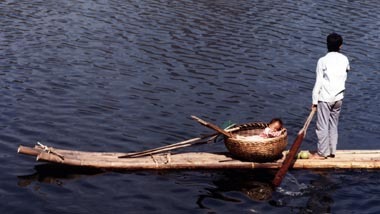 Well, they go to the lake near the Red Flute Cave and enjoy a boat ride with their boy friend, girl friend or their child ! Everything in a very disciplined sort of way, no loud shouting or things like that. Money was a different story in China ! There were 2 valutas: 1 for the Chinese ("Renminbi") and 1 for the tourists "Foreign Exchange Certificates-FEC"). 100 FEC would buy you 120 - 160 Renminbi. Renminbi were good for the streets, streetvendors sometimes never had seen FEC's before. But you could not exchange the Renminbi to foreign currency again. The Chinese were eager to get FEC's as with those FEC's they could buy foreign commodities in Friendship stores (overpriced shops for tourists, but the only place for the Chinese to buy certain articles).